Announcing our 2015 Partners in Conservation grants! 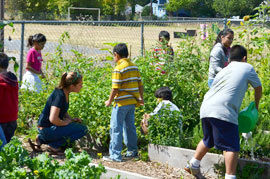 The East Multnomah Soil and Water Conservation District (EMSWCD) awards $739,322 through its 2015 Partners in Conservation (PIC) grants for conservation and environmental education projects. We received 34 PIC applications this year, representing projects in each of five grant program areas: restoration and monitoring, stormwater management and urban landscaping, urban gardens and sustainable agriculture, environmental education, and equitable access to conservation benefits. The PIC grant program funds projects through a competitive process in order to support the efforts that are most closely aligned with the EMSWCD’s strategic priorities. This year, the EMSWCD Board of Directors awarded 24 grants, including two multi-year PIC Plus grants. EMSWCD provides partial funding for most of these projects, with a minimum 1-1 match for all grant amounts over $10,000. EMSWCD’s PIC funding for 2015 will leverage more than $2 million in additional support! A wide variety of projects were funded this year, from a project to restore over 100 acres in the Mirror Lake floodplain to another project that will establish a new community garden at the Floyd Light Middle School in East Portland. Read the full press release here (PDF), which includes the full list of 24 grant projects and details about each. Learn more about our annual and monthly grants here. EMSWCD » Conservation Legacy » Grants Blog » Announcing our 2015 Partners in Conservation grants!